Hispanics now account for 25 percent of all K-12 students in the United States. “Latinos accounted for 25 percent of the nation’s 54 million K-12 students in 2016, up from 16 percent in 2000,” the Pew Research Center’s Fact Tank reported. 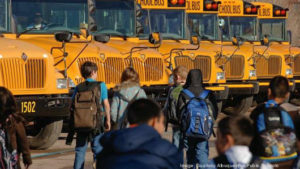 Hispanics account for about half or more of all K-12 students in three states – New Mexico (61 percent), California (52 percent) and Texas (49 percent). Citing Census Bureau numbers, Pew said that the population of Latinos under age 18 surged 22 percent from 2006 to 2016. There are over 18 million Hispanics under 18-years-old in the U.S. Over that same period, whites under age 18 declined by 11 percent, and blacks by 7 percent. According to Census Bureau data, 1-in-7 current U.S. residents are immigrants, the highest level in 107 years. An analysis of the data by the Center for Immigration Studies (CIS) found there are a combined 44.5 million legal and illegal immigrants in the country, the most from Latin America. “America continues to experience the largest wave of mass immigration in our history. The decline in Mexican immigrants has been entirely offset by immigration from the rest of the world. By 2027, the immigrant share will hit its highest level in U.S. history, and continue to rise,” said Steven Camarota, the CIS’s director of research.